Kennesaw State University is one of four comprehensive universities in the University System of Georgia and the third-largest university in the state of Georgia. The mission statement affirms KSU’s commitment to student success. In fall 2016, KSU enrolled 31,611 undergraduate degree-seeking students, a 5.9% increase over fall 2015 (see Table 1.) There has been an increase in the last two years in the percentage of full-time students in the undergraduate population, although the percentage of first-time freshmen attending full-time has remained steady at 97%. Women make up less than half of undergraduate and freshman enrollment. Since 2012, minority undergraduate enrollment increased from 37% to 43% and minority freshman enrollment increased from 30% to 40%. African-American undergraduate and freshman student enrollment increased 5-6%. Hispanic undergraduate and freshman enrollment increased 2-3%. The percentage of students receiving Pell Grants has decreased 2-3% for undergraduates and freshmen. KSU’s retention rates are the highest in five years. Retention increased across all groups based on enrollment status, gender, or race. As shown in Table 2., KSU’s retention rate for full-time students, at 80% is approaching the USG system rate of 81%. KSU’s retention gains for both females and males are similar to system gains with females retained at higher rates than males. For minority students, KSU’s five-year retention gains exceeded USG retention gains. In 2011, the gap between KSU’s rate of 76% and the USG’s rate of 88% for Asian students was 12%. That gap has been reduced to 1% in 2015. KSU’s retention rates for Black students increased 3% over last year and is 7% higher than the system rate. Hispanic students showed an 5% in retention over last year and currently have a rate 4 % higher than the system rate. As shown in Figure 1., the number of bachelor’s degrees conferred has increased 10% in the last five years from 4,261 to 4,687. The number of STEM degrees conferred has increased 28% in the same time period and now comprise almost one-third of baccalaureate degrees completed. Although the number of degrees awarded to students has increased, KSU’S 4-year and 6-year graduation rates for first-time, full-time students have varied approximately 2-3% since 2007. As detailed in Table 3, the USG showed similar fluctuations for these years. KSU’s 4-year rate is, on average, 12% lower than the 4-year rate for the USG. In the last three years, the gap in the 6-year graduation rates between KSU and the USG total has narrowed from 10% to 7%. To understand the relationship between student progression and graduation, it is helpful to look at multiple retention rates and graduation rates together. In figure 2, the lines represent retention rates and the columns represent graduation rates. The top line, Retention to Year 2, is the standard retention measure of how many students return for a second fall term. Retention to Year 3 is the percentage of students who return for a third fall and Retention to Year 4 is the percentage of student who return for a fourth fall. The bottom section of the column is the 4-year Graduation Rate. The middle section, Graduated in Year 5, is the percentage of students who graduated in their fifth year. The top section of the column, Graduated in Year 6, is the percentage of students who graduated in their sixth year. Adding the three sections of the column together gives the 6-year Graduation Rate, the number at the top of the column. Retention rates were relatively flat for first-year, second-year, and third-year retention from the period of 2007-2011. Retention for all years began increasing with the fall 2011 cohort. On average, 77% of students returned for a second year or, conversely, 23% of students did not return. Another 12-16% of students did not return for a third year and 6-7% did not return for their fourth year. Put another way, just over half of students return for a fourth year with the largest losses occurring from year 1 to year 2, and then year 2 to year 3. It should be noted that retention and class standing are not synonymous. A student who has not completed 30 hours in the first year may return for a second year but would still be a freshman. If a student does not take 15 hours a semester, or drops or fails courses, the student is not going to graduate in four years. In 2010, 13% of students graduated in 4 years. One-fifth of students who started in 2010 graduated in five years. A student who is taking 12 hours a semester is considered full-time and may successfully complete 24 credits a year. However, the student is only accumulating 24 hours a year rather than the 30-32 hours required for a 4-year graduation date. The result is a five-year graduate. Less than 10% of students graduated in their sixth year. Slightly over half of students return for a fourth year – and one in ten of those students who did return did not graduate from KSU in that year or in the two years after. In examining data like these, we can look at the relationship between retention and graduation and design appropriate interventions. 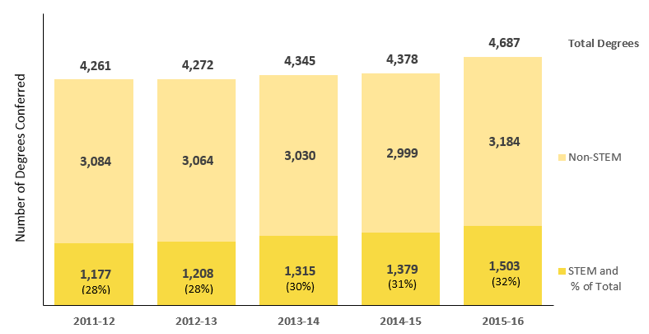 We believe that the retention programs implemented as part of KSU’s Complete College Georgia plan are contributing to the rise in first-year retention rates as well as subsequent year retention rates. For this report, there are four broad categories of strategies that will be addressed. These are: 1) Advising, 2) DFW Rates, 3) Predictive Analytics, and 4) Beyond Financial Aid. Undergraduate advising has been transformed across the institution with new advisors in every college and a common advising platform to coordinate and track outreach and intervention activities. CCG Goal 4: Provide intentional advising to keep students on track to graduate. KSU Bridge Strategic Plan Goal 1: Enhance learning and services that improve retention, progression, and graduation (RPG) rates. Five years ago, the academic advising structure at Kennesaw State University and Southern Polytechnic State University differed not only from the advising model today, but the two distinct (and now consolidated) institutions at the time in their approach to and philosophy of academic advising. Both models were highly decentralized. The SPSU model relied on several professional advisors but was largely dependent on faculty to conduct the bulk of the advising responsibility. Kennesaw State (pre-consolidation) also relied heavily on faculty for advising, but also had professional staff and even undergraduate peer advising in addition to faculty advising. As part of the consolidation, advising has moved to a more standardized model. In August of 2016, KSU launched the Education Advisory Board’s Student Success Collaborative Campus (EAB-SSC Campus) platform to over 80 advisors, staff, and faculty. Used in conjunction with DegreeWorks, EAB-SSC Campus connects advising activity across campus. Advisors are all using very similar processes for scheduling advising appointments, recording advising activity, making more proactive outreach to students who are potentially at risk, and monitoring enrollment in heretofore unexamined ways. Staff: An AVP for Academic Advising was hired to provide centralized leadership and best practices for advising at Kennesaw State University. Primary-role (professional staff) advisors are now seen as the primary academic advising resource in each of the colleges. KSU has added 20 new advising positions in the 2016-2018 fiscal years, and has moved the student: advisor ratio from over 1000:1 to less than 600:1. Training: Advisors have an organizational body on campus (the Academic Advising Network) that provides twice-monthly professional development and advisor training opportunities. Over 20 advisor professional development opportunities were offered since August 2016. The Advising Council (one member of the leadership team from each college) also meets monthly and collaborates on shaping the university-wide role of academic advising as a critical driver of student retention, progression, and graduation. Baseline data are currently being collected for the first year of EAB-SSC. The measures of advising activity, such the utilization and adoption outcomes, should be positively associated with better student outcomes. Students who are actively engaged in the process (e.g., keep appointments, respond to advisor outreach) should ultimately make better academic choices as evidenced by a reduced risk status and their continued progression towards graduation. At the start of Academic Year 2017 (AY17), there were 91 users who were classified as “advisors.” This includes full-time advising professionals as well as other faculty and staff whose responsibilities include advising. By the end of AY 17, there were 155 unique users – an increase of 31%. During the same time frame, the number of advisor logins went from 287 to 1,207 – an increase of 321%. There are 23 active locations on campus providing advising and student support services. As census data become available, progression and retention results will be calculated. In addition, a student satisfaction survey tied to advising appointments was implemented in August 2017. The challenge in launching a centralized scheduling and advising platform for decentralized advising was respecting the autonomy of the different advising units. Advisors provided important input prior to the launch of EAB-SSC and continue to be active participants as the platform is expanded. The Gateways to Completion (G2C) project and Supplemental Instruction both target high DFW rates. CCG Goal 3 - Decrease excess credits. CCG Goal 8 - Restructure instructional delivery. For students, earning a “D” or an “F” or withdrawing with a “W” in a course means additional time and tuition costs. For the institution, a high DFW rate in gateway courses can contribute to bottlenecks as students who need to repeat the course compete with students who need to take the course to stay on track. KSU is participating in Gateways to Completion (G2C) and continuing the Supplemental Instruction program to address high DFW courses. G2C is a national effort led by the John N. Gardner Institute for Excellence in Undergraduate Education to improve student success in large enrollment gateway courses that traditionally have high failure (DFW) rates. KSU is one of thirty institutions nationally and one of ten in the USG participating in the initiative. G2C is a three-year initiative that provides KSU with an institution-wide, data-driven, evidence-based process that includes policy review and course redesign. Faculty-led committees within each of the course disciplines lead the G2C effort. The five gateway courses are: ACCT 2100-Introduction to Financial Accounting, HIST 2112-US History Since 1890, MATH 1111-College Algebra, MATH 1190-Calculus I, and SCI 1101-Science, Society, and the Environment. In 2016-17, the G2C task force engaged in a self-study based on key performance indicators. Quantitative and qualitative course success inventory data and student survey data were used. The self-study resulted in cross-course and course-specific synthesis reports and a comprehensive action plan. Participants in KSU’s G2C course redesign faculty learning community (facilitated by CETL) during 2016-17 will teach their redesigned courses. The call for applications for the second cohort this fall will be open to all faculty teaching gateway courses and up to 25 faculty will be selected. Plans are for a new KSU academic building to be completed by 2020, the Academic Learning Center building (ALCB). The building will house the new Academic Learning Center (ALC) (1st and 2nd floors of the building), and University College will organizationally and physically place KSU's campus-wide tutoring, advising, ESL, supplemental instruction, and learning assistants programs in the ALC and ALCB, making it a one-stop center for academic student support. Course redesign will contribute to a reduced DFW rate, a decrease in excess credits, and increased retention and graduation rates. SI provides structured, peer-facilitated help sessions for students enrolled in courses that traditionally have high DFW rates. Students may choose to attend sessions conducted by a student SI Leader who was successful in the course with the same instructor. These student facilitators provide assistance with devising learning strategies based on course content and instructor delivery style. Course offerings include lower-division courses in math, science, political science, economics, and accounting. Upper-division courses include math, biology, chemistry, engineering, physics, and architecture. Supplemental Instruction is designed to reduce DFW rates and contribute to increased retention and graduation rates. In fall 2016 and spring 2017, there were 24 unique courses offering SI with 185 sections, an 18% increase over the previous year. The SI leaders provided 2,079 sessions for a total of 23,428 contact hours. Students who attended SI were significantly less likely to make a DFW. See Appendix A for more details. With enrollment increasing, lowering the DFW rate is critical to expanding capacity. All of these initiatives require cooperation and coordination between staff and faculty. KSU is committed to using data to support student success. There are three major predictive analytic platforms that are being utilized to increase operational efficiency and provide insights into student success. If needed courses are unavailable, students may take courses that do not contribute to program completion to maintain their full-time status. The implementation of Ad Astra’s Platinum Analytics software continues to help academic departments better determine course demands and identify course bottlenecks which impede the degree progression of students. The result is that departments can better schedule course and seat availability to mitigate the bottlenecks and improve the progression of students toward graduation. The on-going, re-evaluation of course sections allowed academic departments to redirect faculty resources to higher-demand courses. In addition, weekly data-snapshots provided an on-demand analysis of general education courses to help absorb new student enrollment. This analysis includes consideration of student schedule time conflicts and provides optimal times for additions and reductions in seat offerings. Based on historical trends in student enrollment and course preference, evaluation of degree requirements and completion of course prerequisites, the following adjustments were made to the Fall 2017 course schedule (note section offerings may change slightly during the month of August 2017). 98 courses were identified as addition candidates (more seats were needed to meet student demand). For these courses, ~1,500 additional seats were offered when compared to Fall 2016. 176 courses were identified as reduction or elimination candidates (fewer seats were required to fulfill student demand). In working to enhance the ability for incoming students to get required courses, KSU has made significant progress on combatting first-year course bottlenecks. Both before consolidation and during the first post-consolidation year, over half of the 1000 level courses were filled. In Fall 2016, the additional sections added allowed this percentage to drop to 46% in Fall 2016. The new competitive admissions model implemented in fall 2018 should allow KSU to continue to make progress on this metric. KSU plans to implement the new Astra Schedule software in AY18. This software will provide Platinum Analytics course prediction data and course schedule building/room optimization functionality all within one platform. EAB-SSC Campus is designed to support data-driven advising efforts that enable proactive, informed interventions with at-risk and off-path students. Committees met in spring 2017 to discuss college and department specific data available in EAB-SSC. The historical data available in the platform, along with institutional data on retention rates, graduation rates, and grade distributions were examined. In fall of 2017, student success markers will be added to the platform based on these data and conversations. Along with the historical data available in EAB-SSC, advising data and student support services data are available. These data can be used to determine the efficacy of advising outreach and intervention campaigns. Initial data for the first year of implementation are detailed in the Advising section of this report. Baseline data will be collected in the second half of 2017. Consolidated data continue to create challenges for functional and technical groups working on these projects. KSU provides an array of resources for students who may be experiencing financial difficulties. These resources include a limited amount of funds available for GAP scholarships, CARE center support (e.g., food pantry, connection with resources, assistance with homelessness, etc. ), Emergency Retention Scholarships, and other population specific resources for students with unique and special needs. Participating in the BFA initiative provides a framework to increase the understanding of the needs of lower-income KSU students and identify relevant services. The BFA committee completed an extensive review of the BFA strategies. Multiple analyses were performed included an in-depth look at characteristics of 2015-16 Pell recipients, and comparison of student success metrics with peer institutions. A detailed inventory of support services for low-income students was created. Potential action items were generated to increase the visibility and utilization of resources. Policies were reviewed for unintended impacts on students. Ensuring students have the resources they need to complete their degrees should contribute to an increase in degrees awarded. Understanding student need and identifying current and potential areas to meet that need is necessary before more detailed measures can be devised. Initial data reveal gaps between retention rates and graduation rates. The inconsistencies over time in the magnitude of these gaps support the need for further data analysis. Although Pell recipients may have similar financial needs, the circumstances surrounding those needs may be very different. KSU has an abundance of resources available to students, the challenge is connecting student to the right resources in ways to ensure student privacy.